Sunday, May 24 concluded a long and tiresome Barclay’s Premier League campaign. The day spelled heartbreak for some, and jubilance for others. Chelsea were in the middle of it all, as Champions of the Premier League and winners of the Capital One Cup. That being said, Chelsea also did poorly in the Champions League this term, failing to make it past the Round of 16, bowing out to PSG at home on away goals. They also failed in the FA Cup, losing to Bradford City at home. Jose Mourinho’s second season back in charge of Chelsea had several matches that kept fans on the edge of their seats. Whether it was their victory against Liverpool in the Capital One Cup Semi-final, or their 5-0 rout of Swansea, Chelsea certainly kept fans entertained. An interesting point about Chelsea’s campaign was the difference in which they approached games in 2014 and 2015. In the earlier part of the season, Jose Mourinho’s men were entertaining, flashy and overall brilliant. They outscored opponents with class, and strung together passes with accuracy and precision. However, in the second part of the season, Chelsea closed their shell, taking a more pragmatic approach to matches, allowing very few goals, but scoring a lot less at the same time. Mourinho made this change, following the New Year’s day thrashing at White Hart Lane. This served as a wake up call for Mourinho and Chelsea, as they realized they would need to make tweaks in order to get across the finish line as Champions. The loss to PSG furthered that thinking when the Blues conceded two corner kick goals at home, spelling the end to their Champions League run. The outstanding performers of the season are hard to choose. I would prefer to use a top six approach. This ranking discludes Mourinho himself, as he is the mastermind and would win any competition. It also will disclude players that had bit-part roles like Cech and Luis. At sixth, it’s Cesc Fabregas. Although it pains me to put this lad at sixth, I can’t justify him over anyone in the top 5. That being said, Fabregas was sensational this season. He had a hand in most goals that Chelsea scored this season. He was the catalyst for Chelsea’s attack and flourished in his role next to Matic. He has surely been one of the best summer signings. 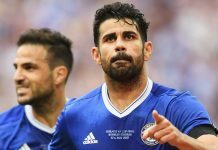 Fifth goes to his partner in crime, Diego Costa. The talisman has been prolific this season, finishing all of the opportunities that Chelsea should have put away last season. He was exactly what the Blues needed to finish as Champions this season. Had he been more healthy, Costa would have probably won the Golden Boot, allowing Chelsea to lock up the title sooner, and he would be higher on this list. Hopefully next season he is able to remain in better health. In fourth, it’s Chelsea’s goalkeeper, Courtois. The Belgian has been brilliant for the Blues. To replace Cech in his first season back at Stamford Bridge seemed an impossible feat. Not only did the 22-year-old replace him, but he justified his place, singlehandedly keeping the Blues in games that they had no right being in. Courtois was clutch and he’s only going to get better. Third, is Matic. And the Serbian deserved even more praise than that. He played maybe 2 bad games in all competitions. The lad is fantastic. He shields Chelsea’s defense, better than any other defensive midfielder could. It boggles my mind how graceful he is at his size and shape. Matic was Chelsea’s MVP this season. Second, and it’s amazing that he’s still this vital to the Blues, John Terry. The Englishman is a warrior and has proved that time and time again this season. He has held the defense together. The most vital aspect of Terry’s role this season has been his ability to mentor Chelsea’s youth, while at the same time maintaining his level of play. First, Eden Hazard. The Belgian has been sensational this season. He is now considered a top talent. The lad came of age this season. He’s still getting better and needs to improve on shooting and scoring more goals. But Hazard will win a Ballon D’Or. I guarantee it. Overall, Chelsea have been sensational this season. However, they left themselves room for improvement by their subpar performance in the Champions League. Next season, Chelsea should run away with the league again. However, the real test will be how well they can ply their trade on the European stage. I think they will succeed but only time will tell. Next articleShould Chelsea Offload Cuadrado Already?